The AirSense 10 CPAP Machine with HumidAir is a polished looking machine and built-in humidifier designed with user experience in mind. 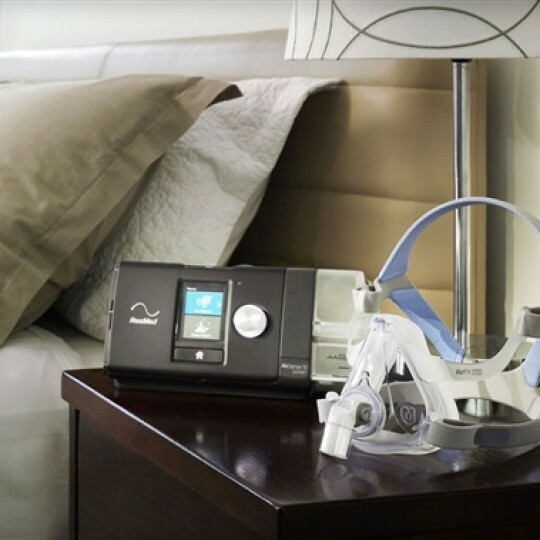 Easily understood menus, SmartStart, and quiet operations are a few of the features that make this CPAP a great option. This is a single pressure CPAP machine that does not auto-adjust. 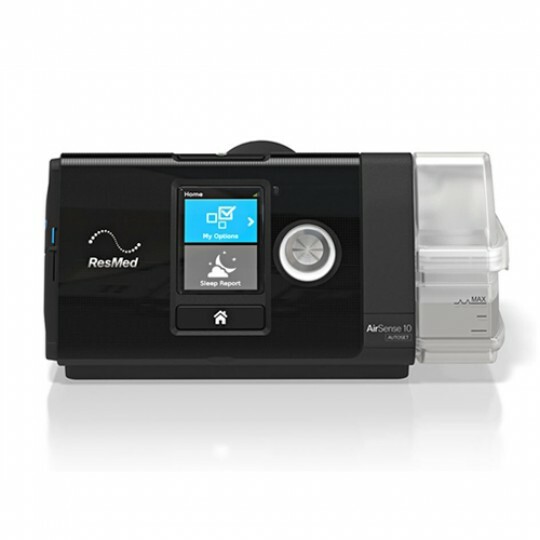 The ResMed AutoRamp™ feature has been improved for even more convenience. No more pressing buttons to activate the ramp feature because ResMed AutoRamp™ with Sleep Onset Detection does the job for you. 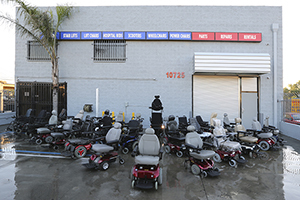 Ramp feature automatically enables with the detection of sleep beginning with a lower pressure. Once asleep the pressure gentle rises to the prescribed level as needed. AirView™ cloud-based PAP therapy management system. Instantly access your therapy progress and data, trobleshoot with the remote assist feature, and adjust settings as well. 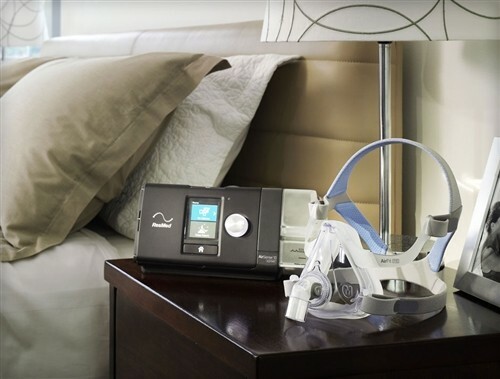 The combination of the HumidAir™ heated humidifier and the ResMed AirSense™ 10 AutSet CPAP with HumidAir™ system sets this unit apart from all other brands. The humidification technology from ResMed is one of the most powerful and technically advanced available on the market to date. Optimal comfort is achieved with the HumidAir™ humidification feature through advanced environment detection and adjusting. No more wondering which setting or when to adjust because the ResMed AirSense™ 10 AutSet CPAP with HumidAir&trade Humidification System has you covered. The ClimateLineAir™ Tube is included and simply takes the ResMed humidification system up a notch. Condensation will be a distant memor with the ClimateLineAir™ Tube which eliminates the water buildup caused by environmental elements working against your PAP therapy. 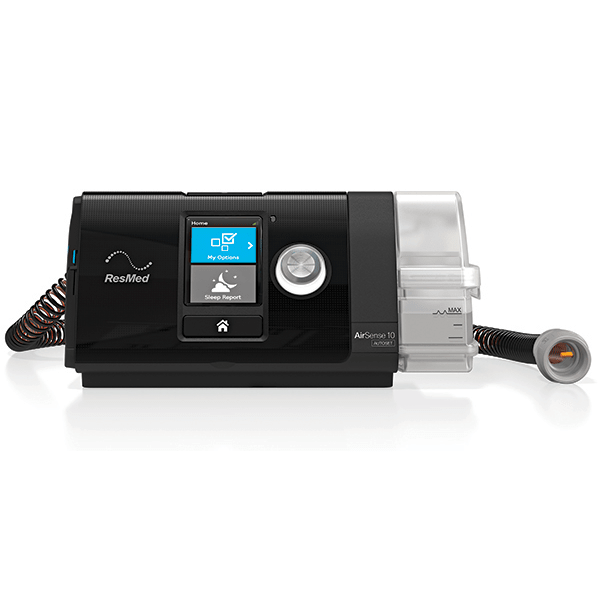 The ResMed AirSense™ 10 AutSet CPAP with HumidAir™ also has intelligent algorithm with Easy-Breathe expiratory pressure relief (EPR™) to dynamically adjust pressure for maximum comfort which has been a great source of comfort in other ResMed lines. Using ResMed's time-tested APAP technology, AutoSet continually monitors breathing, adapting breath by breath to always deliver the lowest therapeutic pressure, improving comfort and sleep. The S9's enhanced AutoSet algorithm now differentiates between obstructive and central sleep apneas (CSA) and responds appropriately. 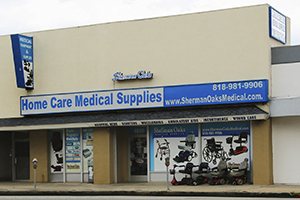 You can be confident that you're always receiving optimal therapy at the lowest, most comfortable pressure. Cleaning Instructions The chamber should be taken apart and hand washed weekly using warm water and a mild detergent. It should be rinsed well and allowed to air dry out of direct sunlight before reassembling. The chamber should not be washed in a dishwasher or washing machine. The SlimLine hose should be washed in the same manner and allowed to completely dry out of direct sunlight before reattaching to the machine and mask.